We help retain your customers. Using the dealers bespoke menu pricing engine, customers can tailor quotes for convenient monthly payments for all of their future routine servicing requirements. Ensure each dealership is engaged with Service Plan sales by monitoring daily, weekly and monthly sales performance using our new Connect App. Give users the facilities to extend, modify, cancel and reinstate Service Plans in real time and remove the need for 3rd party system administrators. Create extremely powerful, date driven, model specific campaigns which automatically adjust the included services and required payment profile. Ease of use means higher staff engagement. 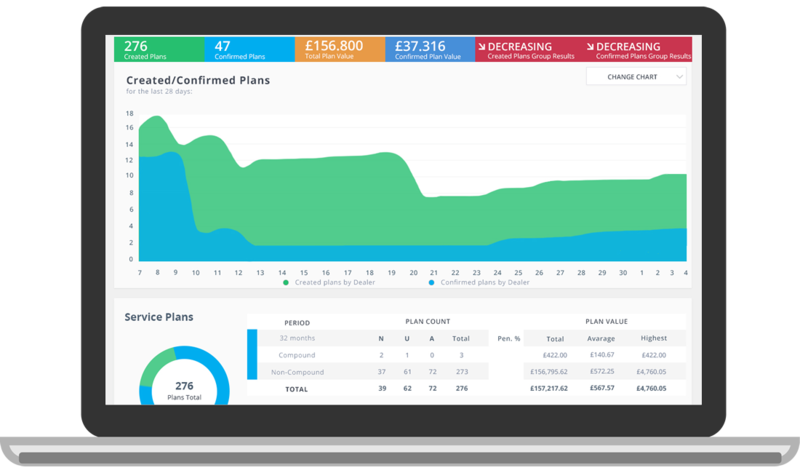 Automatically notify and refund a customer should a plan cancel without the need to involve your accounts department or a 3rd party. Have the system create and email tailored Service Plan quotes for customers visiting the dealership using data from your DMS. Create a fully customised quote in seconds using a VRM lookup cross referenced with your DMS* for relevant vehicle and customer data. Take the work out of plan renewals and ensure that your customers continue to receive the convenience of small, monthly payments for their future service work by automatically renewing their policies. If a customer changes their vehicle all customer details and any available funds can be automatically transferred from their current Service Plan to a new one. Add additional services on top of OEM schemes to ensure the customers servicing needs are covered beyond the life of the new or used vehicle plan, helping increase customer retention. It’s all about the customer. Let customers quote for their own Service Plans to their own specific requirements through an online portal available 24/7. Further improve customer loyalty and penetration by including dealer specific optional services such as MOT’s, air conditioning services or brake fluid changes. Customers shouldn’t receive any surprises when buying or cancelling a Service Plan, this is why we charge no plan confirmation or cancellation fees, with our small charges clearly visible on quotes and contracts. You might want to reward your customers for their loyalty by applying fixed or age related discounts to scheduled and optional services. A statement of account showing all credits and debits to the plan and current available funds can be emailed or posted to the customer on request. The necessity to discount the Service Plan to achieve an acceptable monthly payment is removed, while returns are improved as the plan payment term is maximised. Customers can take out a service plan at any stage in their service lifecycle without the need to take a large deposit at the beginning which can often be a barrier to the sale. Subscribe to a number of group-wide, data rich, powerful reports which can be delivered directly to your inbox, or cast an eye over the real-time dashboards and performance pages to monitor performance. Don’t rely on month end statements or imports by suffix journals into your DMS, a quick check each day of your transaction list with automated DMS balance sheet comparison* means you should balance to the penny. View and restore earlier versions of quotes from the complete log of quote history which can be very useful if one person created the initial quote but another was to sell the plan. Dating all services means that, not only can automated reminders be sent to the customer through Proactive Follow Up when the due date is approaching, but dealerships have a powerful planning tool for workshop loading. the scope of a traditional service plan? If a customer has the opportunity to pay monthly for work identified today but not due for a number of months, they will return to your dealership to have this completed. Several items can be added to one repair plan, each with a potentially different scheduled date, with the correct amount of money collected to cover the cost of each item as it becomes due. Automatically remind customers as their last payment is taken, using our Proactive Follow Up module, that their repair is now due. Don’t let a customer leave your dealership with a potentially dangerous identified Red work concern because they cannot afford to pay for the repair. Each customer’s credit score will be checked in real time during their application, allowing work to be completed immediately upon approval. Once the repair has been completed, payment can be requested and the money transferred into your bank account. Copyright © 2019 eDynamix Global Ltd. All rights reserved. What types of cookies does eDynamix.com use? There are generally four categories of cookies: “Strictly Necessary,” “Performance,” “Functionality,” and “Targeting.” eDynamix.com routinely uses all four categories of cookies on the Service. You can find out more about each cookie category below. 1. Targeting Cookies. eDynamix.com, our advertising partners or other third party partners may use these types of cookies to deliver advertising that is relevant to your interests. These cookies can remember that your device has visited a site or service, and may also be able to track your device’s browsing activity on other sites or services other than eDynamix.com. This information may be shared with organizations outside eDynamix.com, such as advertisers and/or advertising networks to deliver the advertising, and to help measure the effectiveness of an advertising campaign, or other business partners for the purpose of providing aggregate Service usage statistics and aggregate Service testing. First-party cookies are cookies that belong to eDynamix.com, third-party cookies are cookies that another party places on your device through our Service. Third-party cookies may be placed on your device by someone providing a service for eDynamix.com, for example to help us understand how our service is being used. Third-party cookies may also be placed on your device by our business partners so that they can use them to advertise products and services to you elsewhere on the Internet.